7 Coin Proof Set (Royal Canadian Mint, 1986) Buyer. Royal Canadian Mint. 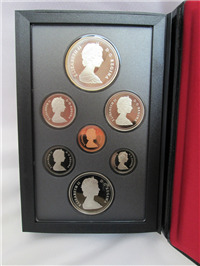 Face value is $2.91 Canadian Dollars, includes a Locomotive dollar, Indian and Voyageur dollar, Coat of Arms of Canada half dollar, Caribou quarter, Fishing Schooner dime, Beaver nickel,and Maple Leaf penny all housed in a clear, sealed, double-sided display and boxed in a Genuine bonded Leather black Maple leaf book type case with a plastic box with lid container and with certificate of authenticity.